Savvy Gardening's Jessica Walliser wins a big book award! We’ve got some big news for you, Savvy readers!! 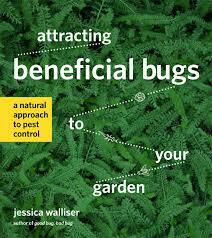 Our very own Jessica Walliser has won the prestigious American Horticultural Society Book Award for her latest work, Attracting Beneficial Bugs to Your Garden: A Natural Approach to Pest Control (Timber Press)! Way to go Jess! Tara and I (Niki here!) are all so proud of Jessica’s amazing accomplishment that we wanted to share it with the world. Plus, the message Jessica offers in this book is both critical and timely. Jessica’s book was released in late 2014 and it’s still on my desk because I go back to it so often. The message she shares is vital to all gardeners, both food and ornamental: inviting and supporting these insects not only benefits our gardens, but also the entire ecosystem. The fact that Jessica’s book won this award lends weight to the importance of the issue. The American Horticultural Society (AHS) honours just a handful of outstanding garden books each year, each carefully chosen and debated by a committee of garden communicators. 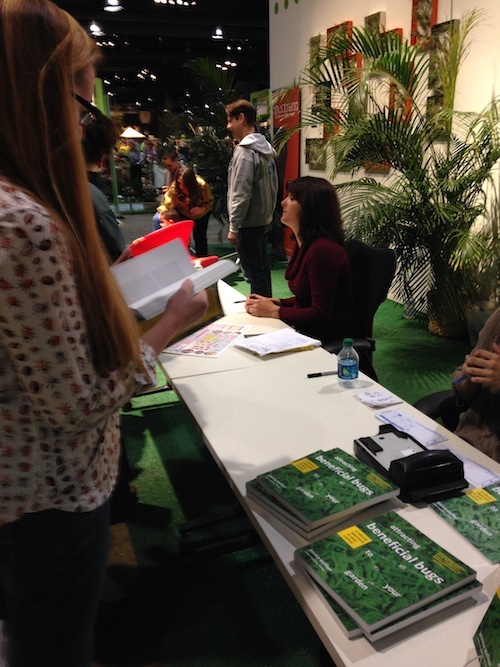 Jessica Walliser signing copies of her book at the Philadelphia Flower Show. To further promote the idea of gardening for the good bugs, I asked Jessica to share three reasons why gardeners should consider these creatures when designing and choosing plants for their gardens. Though insects have a bad reputation in the garden, the truth is that less than 1% of the world’s identified insect species are considered to be pests. The vast majority of insects are good for the garden; they pollinate our crops and help control pest insects by preying upon them or using them as hosts for their developing young. It’s important for gardeners to realize that a healthy population of beneficial predatory insects in the garden means a marked reduction in many pest insects. It’s quite possible to achieve a healthy balance of insects in the garden, but you first have to know how to recognize and encourage the tens of thousands of beneficial predatory insects that call your backyard home. What do you do for pollinators and other beneficial insects? We’d love to hear your feedback and experiences in the comments of this post. Congratulations to Jessica for winning the prestigious American Horticultural Society Book Award!